An element of the type "Instruction" is the fundamental algorithmic element and may contain any command or simple statement. If the input instruction comprises several variables then they are to be separated with commas. The targets of an input instruction will be registered as new variables if not already introduced before. An input instruction without variable is allowed (and will just wait for the user to press the Enter key as confirmation). OUTPUT "The result is ", value+9, "." The expressions will be evaluated and the text representations of their values are written into a common output line in their order of occurrence. The next output expression will not continue the same line but start a new line. An output instruction without an expression is allowed and will produce an empty output line. The very first assignment to a variable is called an initialization. Structorizer will not register a variable before it has been initialized (or targeted by an input instruction). Internal procedure call (like e.g. forward(100) to move the turtle within the Turtleizer window, further procedures see Syntax). To call a procedure not being built in but referencing another diagram, however, it is suggested to use a CALL element rather than an ordinary Instruction element. Auxiliary stuff like declarations (of variables) and definitions (of types or constants) should preferrably be placed at the very beginning of a diagram. For a list of built-in operators, functions, and procedures usable within instructions (and other elements) see Syntax. 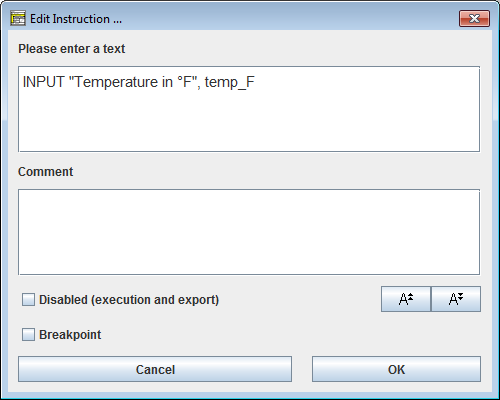 The input instruction implicitly introduces variable temp_F. Variable names in an algorithm will contain neither greek letters nor subscripts, so we had to rename it. 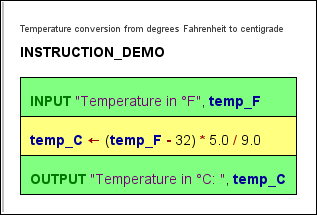 The yellow assignment instruction introduces the variable temp_C. As you see, the assignment contains the formula nearly as above with some inconspicuous but important differences, though: A variable means a named storage place that has to be filled with a value, therefore we need an assignment operator (the leftward arrow or ":=") rather than an equality sign to transfer the result of the computation into variable temp_C. The multiplication is expressed by an asterisk. For the division, we make better sure the numbers are interpreted as real (floating-point) numbers lest the result should be that of an integer division; therefore they are better written with decimal points. How to build this diagram, now? 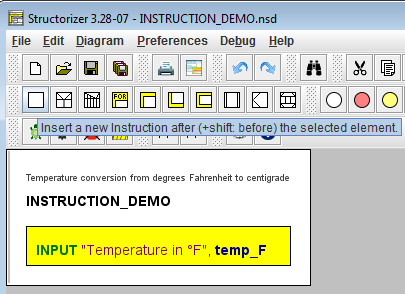 You may download the Instruction demo diagram here. Usually, an Instruction element contains a single statement of one of the kinds listed above. 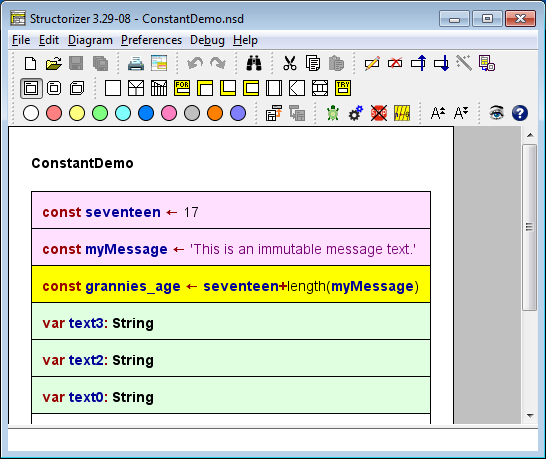 For convenience, however, the Structorizer allows an Instruction element to contain more than one statement. In the latter case, use one line per statement (in other words: place one statement per line). But be aware that e.g. breakpoints can only be attached to an entire element, not to a single line. It is not recommended to combine statements of different kind (e.g. 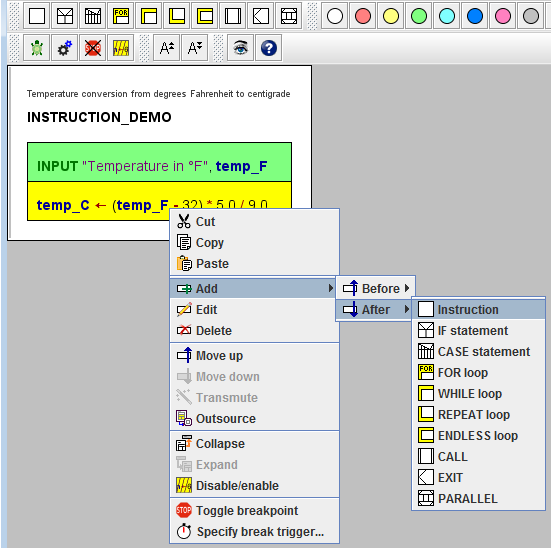 input instructions with assignments or output instructions) within a single Instruction element. 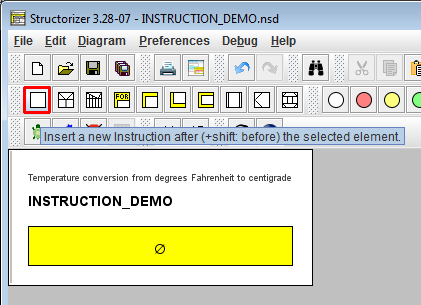 By the magic wand button you may merge a sequence of selected Instruction elements into a single Instruction element or, conversely, split a multi-line Instruction element to a sequence of separate Instruction elements consisting of a single statement line each. DON'T let an Instruction element contain empty lines. The type specifications in declarations are rather informal and not restricted to a certain programming language. Up to now, most declarations (with one important exception!) in Structorizer do not directly restrict the kind of value you may assign to a declared variable - you can always override the declared type. But the declaration may influence code export and under certain circumstances be converted into a correct declaration in the target language. The code generators use some type name mappings and try to make sense of different ways to declare arrays. The mentioned exception from type tolerance are the record types (aka struct types, also introduced with release 3.27). Since components of variables of these types are accessed via so called qualified names (the variable identifier is followed by a dot and the component name), the knowledge about the user-defined structure of a variable is essential for the parsing of expressions. Therefore type definitions had to be introduced (see below). Variables may not be used as records if they weren't explicitly declared with a previously defined record type, and declared record variables may not simply be abused for other kinds of values. Note that the variable names introduced by declarations will not be highlihghted unless they are initialized somewhere. Instruction elements may also contain constant definitions. Syntactically they look just like variable assignments but with a preceding const keyword. Semantically, constants are indeed handled like immutable variables by Structorizer. This means they can be set only once. The value may be computed by an expression. The Analyser may check whether all involved operands are literals, defined constants, or constant expressions themselves. Further attempts to assign another value to a constant or to alter the defined value will be prevented by the Executor. Structorizer guarantees the constancy in a generous way, though. So you may assign a complex constant object (say an array) to a variable. If you assign an array held by a variable to another variable, both would share the same object. Obviously, to do the same with a complex constant object would compromise constancy or make the target variable implicitly a constant. Rather than raising an error in such a case, Structorizer will just assign a mutable copy of the constant object to the target variable. This goes smoothly but ensures the expected consistency sufficiently. The formal parameters of routines may also be declared as constant by placing a preceding const keyword. In this case, the value passed in from the respective argument on calling the routine may not be altered within the function (read-only semantics). Again, with passed-in arrays you obtain only an immutable copy, which prevents a compromising impact on the original array. The left-hand side of a constant definition (i.e. 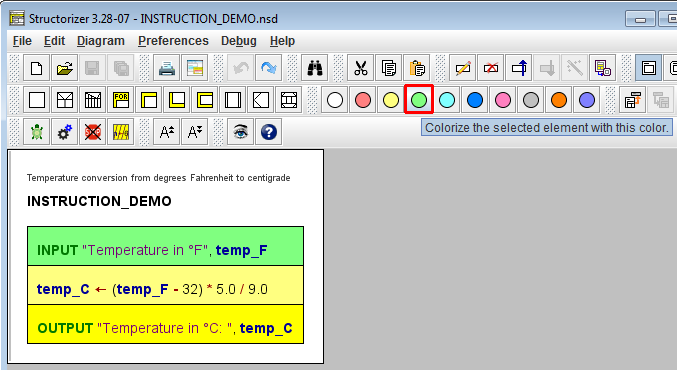 left of the assignment symbol) may also contain a type specification, thus looking like a variable declaration but that the const keyword replaces the var or dim keyword. With the const keyword, even a C-like type specification would be possible. As with variable declarations, type specifications are rather informal (and not restricted to type names of a certain programming language). Moreover, they are redundant here because the type may be derived from the constant expression. But they may yet be helpful on code export. 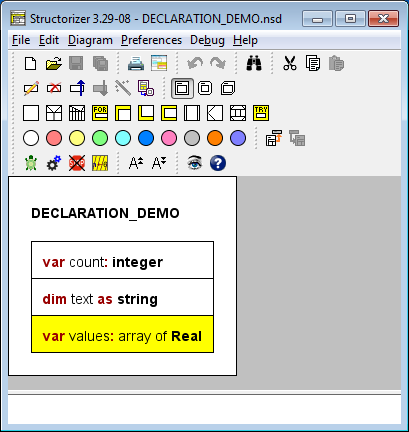 Instruction elements may also contain type definitions. As outlined with the paragraph about variable declarations, they became necessary with the introduction of record/struct types. Record types may also be used as parameter types of subroutines. But be aware that in this case both diagrams (the caller und the called one) must know the type, otherwise the argument passing wouldn't work. 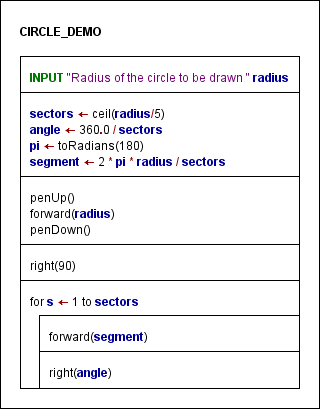 In such cases, you must place the type definition in an additional diagram of type Includable and put the name of this includable diagram in the include list of both communicating diagrams (you have access to the include list of a diagram via the button "Diagrams to be included" in the Program / Sub editor).